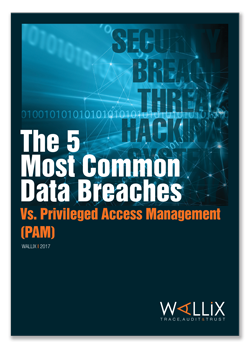 Download our free paper "The 5 Most Common Data Breaches Vs. Privileged Access Management (PAM)"
Data breaches often result from a malicious (or negligent) actor gaining administrative access to key systems. Examples include insider threats, employee mistakes and vendor-driven attacks. While many security issues are at work when an organization gets hacked, the control of privileged access is one of the most common and serious. This eBook explores how a Privileged Access Management (PAM) solution can help reduce the risk of improper privileged access leading to a breach. It discusses how PAM solutions enable security managers to achieve a faster, clearer understanding of how a breach occurred in order to remediate its effects as quickly and effectively as possible.